Josphat Ngonyo Executive Director of African Network for Animal Welfare, a lead organization in the Kenya Biodiversity Coalition, is coming to Seattle! Kenya is currently at a crossroads between burgeoning organic movements, and its participation in the “New Green Revolution” for Africa, financed by the Bill and Melinda Gates Foundation and their partners. As a representative of farmer organizations in Kenya, Mr. Ngonyo will discuss the social, economic, and environmental consequences of the new green revolution agricultural model. He will also share stories with us of resistance to this approach and information about actual alternative agricultural practices. 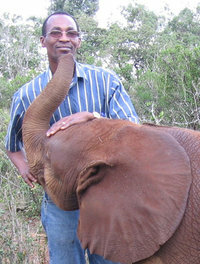 Josphat Ngonyo is Founder and Executive Director of African Network for Animal Welfare, a lead organization in the Kenya Biodiversity Coalition (KBioC). CAGJ’s Director, Heather Day, recently met with Josphat and many of his colleagues in KBioC, who are taking the lead in resisting the introduction of GMOs into Kenya, and promoting agroecological alternatives.